The National Urban League released its 2017 State of Black America report on May 2, during its annual Black America Empower­ment Summit in Washington, D.C. The report, themed, “Protect Our Progress,” included the NUL’s Equality Index, which documents progress towards its mission of economic empowerment for Blacks and Latinos. The 2017 Equality Index for Black America overall is 72.3 percent, and for Hispanics, it’s 78.4, which means these groups are missing 28 and 20 percent, respectively of the American pie vs. whites, when it comes to equality in social and economic indicators, according to Marc Morial, National Urban League (NUL) president and CEO. “Much of the information in the statistical study comes from 2016,” said Morial during an exclusive, sneak preview teleconference with journalists from the Black Press on April 25. This marks the 41st year of the NUL’s State of Black America (SOBA) report and the 14th year that it’s included the Equality Index. Both give a snapshot of the conditions of Blacks and Latinos in the United States. According to the report, blacks are 56.5 percent on the Equality Index, compared to white economics. Further, blacks are 80 percent in health, 78.2 percent in education, 57.4 percent in social justice, and 100.6 in civic engagement. Hispanics are at 62.1 percent in economics, 108.8 percent in health, 75.3 percent in education, 69.7 percent in social justice, and 67.3 percent in civic engagement, compared to whites. “What we can say is that 50 years after the Civil Rights Act, equality and equity remain elusive to many African-Americans,” said Dr. Silas Lee,” professor of Sociology and Political Science at Xavier University in New Orleans. “The data also reflects that the malignant fungus of institutionalized discrimination continuously impacts the social and economic status and the mobility of African-Americans in society,” said Lee, who served as SOBA’s 2017 executive editor. “Yes, we’ve made progress, but at the same time, it gets interrupted, and progress is not linear” he added. In the education section of the report, data showed a high percentage of black teenagers between 18 and 24, who have earned an Associates Degree, according to Valerie Wilson, an economist with the Economic Policy Institute. She said SOBA analysts also saw signs in high school dropouts out rates for all students, not just blacks but that data was offset when viewed in the context of the share of young people between ages 14 and 17 enrolled in college, Wilson continued. “The headline is almost always the same, and we don't see a lot of progress from year-to-year. We’re still a long ways from full equality, but I think a lot of the finer points can get missed from year-to-year, because often, advances in some areas offset lost in other areas,” Wilson said. She also noted there were some significant improvement. The Black unemployment rate has continued to decline, as a result of the ongoing recovery, Wilson added. “We’ve seen a boost in black women’s earnings between last year's index and this year’s. We’ve seen a decline in a share of Blacks with high-priced loans, as well as a growth in the share of Black owned businesses,” Wilson said. She further noted, there’s been a decline on the Social Justice Index, but warned that half of that was due to a change in data reporting by the Bureau of Justice since last year. Specifically, there’s been a discontinuation of reporting on one of SOBA’s main data points, Wilson explained. SOBA’s contributors also included reviews of the disparities and progress in equity, how energy impacts and resolves some persistent unemployment problems in the black community, and how not investing in education diminishes social and economic return. They looked at justice for all (theyre not saying a slogan here. They looked at justice for all people) and how to build more inclusive momentum, social and economic change, voting rights and the impact of various laws and obstructing access. 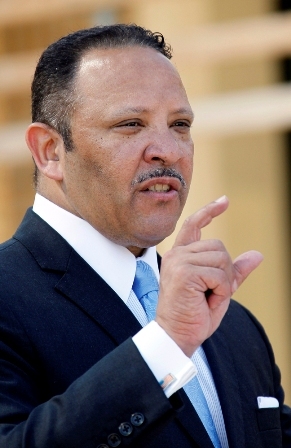 This year’s theme also represented a resistance to the roll back of 2016 gains, according to Marc Morial, NUL president and CEO. That’s why part of the 2017 SOBA report included the “Obama scorecard,” an examination of former president Barack Obama’s administration, Morial said. “We gave President Obama an excellent rating, which is our second highest rating,” Morial said. According to Morial, SOBA credited Barack Obama with much of the improvements noted in the report. The increase of Blacks with Associate’s Degrees, declines in high school drop outs, declines in black unemployment, all took place under the Obama administration, he said. “Very importantly, the progress, when we measure Pres. Obama, looked at whether things had changed from the day he took office, to the day he left office. And in that regard, there was tremendous progress through very, very difficult times, with some areas where we gave the president low marks,” Morial stated. According to Moral, the data showed that Black homeownership declined on Obama’s watch and never recovered. And the prospect of support for small, black businesses and loan values for Blacks continued to decline, even to the latter years of his administration, Morial added.